The mysterious artifacts—depicting strange beings with elongated heads, and oval-shaped eyes, as well as objects that resemble “spaceships” have been unearthed by a group of explorers in a Mexican cave. A group of explorers has discovered in a Mexican cave evidence what they boast as the best evidence of alien contact on Earth. The group of explorers recently visited the cave and explored it in detail. The cave—part of three caves actually—is located between the cities of Veracruz and Puebla. 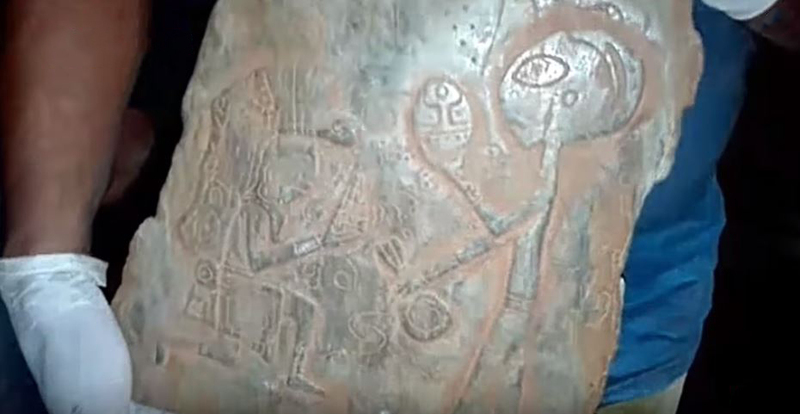 In two of the cases, researchers made unexpected discoveries including several carved stones with images that represent alien related engravings. Furthermore, the group of explorers discovered a number of golden items in another cave. On the surface of the stones, the group of researchers found evidence of what many people interpret as ‘extraterrestrial ships’ and ‘humanoid beings’; one of the stones, which was apparently fractured sometime in the past, supposedly shows the upper part of a spaceship together with a being which according to some people, is not from this world. The entire story sounds too good to be true—but is it? It is reported that local legends speak of a mysterious ‘ship’ that has remained since time immemorial, hidden somewhere near the caves. This was the main reason why the group of explorers set out to search the area three months ago. Their search has yielded totally unexpected results. They have come across—what they believe is—the ultimate evidence that aliens beings visited Earth thousands of years ago, and had direct contact with ancient cultures inhabiting Mexico at that time. What the discovery suggests or, what implications the group of explorers will have is still to be seen. Jose Aguayo explained how INAH—The National Institute of Anthropology and History—can not say anything about the find since it is not typical archeology for one main reason; the artifacts depict things that contradict mainstream history and go everything we’ve been told about our history and origins. “If at any given moment the National Institute of Anthropology and History decided to collect the artifacts, it would have huge implications for both sides since the INAH—an official government agency—would basically accept one of the most denied ‘facts’—the existence of beings not from Earth, who directly influenced ancient cultures around the globe.